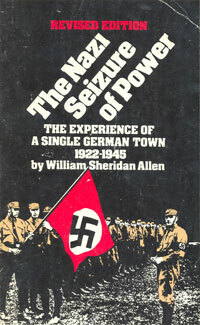 William Sheridan Allen, The Nazi Seizure of Power. The Experience of a Single German Town, 1930–1935, Chicago: Quadrangle Books 1965/London: Eyre & Spottiswoode 1966; German translation: „Das haben wir nicht gewollt!“ Die nationalsozialistische Machtergreifung in einer Kleinstadt 1930–1935. Aus dem Amerikanischen von Jutta und Theodore Knust, Gütersloh: Mohn 1965; French translation: Une petite ville nazie, 1930–1935. L’Histoire que nous vivons. Traduit de l’anglais par Renée Rosenthal. Préface d’Alfred Grosset, Paris: R. Laffont 1967; revised edition: The Nazi Seizure of Power. The Experience of a Single German Town, 1922–1945, New York: Franklin Watts 1984. Northeim is a town on the Leine River situated in the hilly region of Lower Saxony between Hildesheim and Göttingen; to historians it is known as the location of William Sheridan Allen’s path-breaking study of the Nazi Machtergreifung. The book was based on a 1962 dissertation at the University of Minnesota, and Allen first published it while at the University of Missouri in Columbia in 1965. Within two years, it appeared in England and was translated into German and French. Allen had settled at the State University of New York in Buffalo by the time I read the second, revised edition (New York 1984), which I used to write this review. In the forty years since its publication, Allen’s readable history became a standard for undergraduates in North America; and his microhistory of the Machtergreifung has been replicated in most German localities. A number of American scholars in particular have followed in Allen’s footsteps: Peter Fritzsche, David Imhoof, Rudy Koshar, and others, including myself. Part of the reason for the interest of American doctoral students in German Mittelstädte is, of course, pragmatic. When one has limited time and money for a research trip abroad, it seems reasonable to select for study an ‘überschaubare’ provincial town. The peculiarities of American culture is surely another reason that historians from the United States look for the German equivalent of ‘middle America’ in what Mack Walker called ‘German home towns’.1 But in the end, German historians from many countries, including Germany, have adopted Allen’s method because close investigations of events ‘on the ground’ offer a necessary balance to modern German histories ‘writ large’. For Allen, the problem of the Third Reich lay in the Nazi seizure of power (‘how a civilized democracy could be plunged into a nihilistic dictatorship’). Allen showed that, between 1929 and 1937, ardent local Nazis skillfully ex-ploited social divisions, economic crisis, and political stalemate to seize and then establish firm control over Northeim. While most historians were still framing that question in terms of national politics, Allen argued that ‘the actual seizure of power […] occurred largely from below’ (pp. xii, 295-296). Instead of studying Hitler, Allen in effect attributed the same tactical genius to ordinary Northeimers. Local Nazis organised an efficient party structure using the connections, independence, and concern for detail typical of small businessmen. Sensitive to their audience – in large part because they had to pay for their own speakers – they carefully adjusted their propaganda to topics that appealed locally. They also relentlessly thrust their ideas into the public eye through meetings, petitions, marches, demonstrations, overblown rhetoric, and intentionally staged conflicts that often led to riots. Allen described these early fighters as cleverly exploiting the antipathies between rigidly opposed socio-political camps during what amounted to a classic crisis of modernisation. In his account, Nazi antisemitism served as a sideshow distracting attention away from the main political conflict between social democracy and irrationalism. ‘The depression engendered fear’ (p. 24): not so much of its economic impact on the middle classes as of its potential to radicalise the workers. Northeim’s middle classes found Nazi violence distasteful, but they feared Marxism more, and they thought the Nazis were the only people willing to defend them from it. The traditional methods of other parties to counter Nazi drive and enthusiasm seemed, in comparison, to lack luster. The meteoric rise of the Nazis from a small band of early fighters to one quarter of the electorate by 1930 and an almost two-thirds majority by 1932 may have come primarily from the nationalist middle classes and prior non-voters. Yet Allen made it clear that, even before 1933, these crude, brutal men had translated their violent words into violent deeds publicly and vigorously. Fascists may win elections on law and order platforms but only after brutalising civil society in the first place. Allen included the consolidation of power in his understanding of the Nazi revolution. While the Reichstag fire of 1933 was an excuse for Nazi terror in Berlin, in Northeim it provided an excuse for the search and discovery of weapons hidden by Marxists. Thereafter local Nazis undermined the rule of law, coordinated local institutions, purged political opponents both outside and inside the NSDAP, and aryanised everyday life – though Allen treats the Jews again as just one example of terror-induced alienation rather than an overriding goal of Nazi policy. Running parallel to the assault on formal institutions were also tectonic shifts in informal practices ranging from how one listened to the radio to tracing one’s Aryan ancestry that reinforced and maintained the system of terror. Yet if ‘Nazi’ public works and welfare projects seemed to bring the depression to an end, Northeim settled into a kind of stasis by 1935. Contented Nazi administrators from the mayor to the block warden colluded with the citizenry to maintain equilibrium between formal acquiescence and ritualised participation. Allen showed time and again that this ‘long’ Nazi revolution had depended upon ordinary Germans for its implementation and initiative. To use the language of subsequent historians, National Socialism was made salonfähig by local elites and spread through overlapping networks of local social organisations. The momentum for the Nazi revolution lay in a combination of ideological conviction and structural competition between local Nazi bigwigs. The NSDAP was astutely sensitive to the play of their ideas among ordinary Germans, but they announced their state terrorism in the media, and ordinary Germans played a key role in promoting terror through denunciation and social alienation. Since 1965, we no longer believe that Nazi ideology was simply an excuse for the pursuit of other interests. Historians today recognise that many Nazis were serious about their convictions – even if they were also flexible and tactical about their application as well as tolerant of those who went along with those principles whatever they privately believed. Accordingly, the ‘vanishing point’ for historians of the Nazi revolution has shifted from 1933 to 1941, as Helmut Walser Smith has argued; the problem that needs explaining is no longer a fascist dictatorship but a genocidal war.2 Cultural historians have also redefined the problem of Nazi totalitarianism from an acute failure of liberal institutions of state and society into a chronic malaise of modern societies based on the microphysics of power in everyday life. But historians have stuck to the arc of Allen’s interpretation by arguing that Germans became Nazis, Aryans, and Jews through small-scale ‘seizures of power’ in everyday life. In this version of the Nazi revolution, the momentum for the Holocaust still lies in dynamics of anticipatory violence involving both Nazi subalterns and ordinary Germans. Allen provided example after example of Northeimers waging political warfare over the future of Germany using every possible political tool from national elections and plebiscites to local, church, and school elections, newspaper ads and party rallies, flags and greetings, union busting and brawling. Allen knew full well that Northeim was atypical: local Nazis achieved absolute majorities before 1933 in few other municipalities. Yet he did not measure Nazification solely, or even primarily, in terms of the quantity of Nazi supporters but by the qualities of the interaction between ordinary Northeimers on the one hand and between the local and the national on the other. These same dynamics took place in each locality across Germany, and later in Occupied Europe, regardless if it was a Nazi Hochburg or not. Northeim was not representative in this sense but paradigmatic. Allen’s focus on the local was never prosaic or naïve. He knew that everyday customs and quaint architecture gave Northeimers ‘a sense of being snug, enclosed, protected from the outside world’ (pp. 4, 6-9, 13, 22, 24, 146), and that social relationships and local customs could put a break on ‘cold and systematic violence’ (pp. 299-301). Yet long before the Historikerstreit, in which historians on both sides misconstrued the problem of Alltagsgeschichte as either the ‘normalisation’ or the categorical ‘abnormality’ of the Third Reich, Allen’s detailed accounting of each step in the Nazi revolution implicitly placed the ‘normalcy’ of life in the provinces in question. It is not clear to this reader if Allen believed that it was possible to remain a ‘bystander’ during the Third Reich (pp. 301-302). Could provincial Germans avoid collaborating thanks to their geographic isolation from the centres of Nazi power? Or was the Nazi revolution effective and durable precisely because Germans coordinated their behaviour to fit its essential premises?3 Allen hinted at times that Gleichschaltung did not require obedience in all things but left room for, indeed depended on, postures of non-conformity, irony, and parody. But he left this issue unresolved – in part because his wide-ranging analysis treated politics in both ‘structural’ and ‘poststructural’ terms, avant la lettre. Allen sometimes trusted his sources too much. Because they serve particular socio-political milieus, newspapers tend to overstate the role of those camps in making history. Allen similarly accepted his informants at their word when they claimed: ‘There was no real comprehension of what the town would experience if Hitler came to power, no real understanding of what Nazism was.’ Northeimers had claimed to be surprised by the ‘new’ antisemitism introduced by the Nazis after 1933 and even suggested that they moderated their antisemitism. Allen concluded that the problem of fascism was thus one of ‘perception’, best addressed, at least to start, by enlightenment (pp. 86-87, 219, 243-244, 259, 290-291, 302-303). But if Allen’s day-by-day account of each speech, riot, trick, scandal, and insult perpetrated by local Nazis demonstrates anything, it is that Northeimers knew precisely what they were getting with the Nazis. They clearly understood the Nazi dystopia because they adjusted their behaviour more or less in keeping with Hitler’s expectations. A more accurate reading of these interviews would have taken seriously the deceptions they employed to play such contradictory roles in the Nazi revolution. One of Allen’s greatest accomplishments was to pioneer the use of oral history to study the Nazi past, and for this we owe him a great debt of gratitude. In this regard, Allen’s work has recently acquired a strange new relevance in the United States. In his dissertation and the first editions of his book (in English and German), he used pseudonyms for the town and people he interviewed in spite of the fact that most of his interview partners were recognisable public figures. For Allen to tell his history of ‘Thalburg’, however, he had to describe many details such as its location in a river valley along major railroad lines, its predominantly Lutheran population, its many government employees, and the role played by the German Hanoverian Party in local politics. It was easy for an intrepid journalist to use such particularities in order to unmask Northeim and deduce the identity of some of Allen’s informants (p. xviii);4 starting with his second edition, he abandoned these pseudonyms. However, Allen made reasonable ethical choices in this regard. The United States Federal Government has, in the meantime, passed legislation facilitating the mandatory review of research protocols involving human subjects, in part in response to the mistreatment of camp prisoners by the Nazis. In the computerised training sessions used by many American universities to inform researchers about these regulations, Allen’s study serves as an example of unethical research practices because of his alleged failure to protect his human subjects from potential harm.5 What is happening, in fact, is that non-historians are misapplying principles from clinical, therapeutic, and behavioural research to oral history and thereby undermining the crucial role that oral history plays in a healthy public sphere. It represents a gross injustice to a scholar whose innovative research played a catalytic role in changing the way democratic societies relate to their troubled pasts. Allen’s oral history was responsible precisely because Allen challenged Northeimers to consider their complicity, and that of their neighbours, in the Nazi revolution. In light of the fact that Allen explained how ordinary people can undermine democracy in Germany, it is a scary irony that American scholars and public officials, who have no real understanding of historical scholarship, are using Allen’s study to sanitise oral history as a critical practice. 1 Mack Walker, German Home Towns. Community, State, and General Estate, 1648–1817, Ithaca 1971. See also Brigitta Schmidt-Lauber (ed. ), Mittelstadt: Urbanes Leben jenseits der Metropole, Frankfurt a.M. 2010 (in preparation). 2 Helmut Walser Smith, The Vanishing Point of German History: An Essay on Perspective, in: History & Memory 17 (2005), pp. 269-295. 3 Cf. Andrew Stuart Bergerson, Ordinary Germans in Extraordinary Times. The Nazi Revolution in Hildesheim, Bloomington 2004, and Peter Fritzsche, Life and Death in the Third Reich, Cambridge 2008, to Panikos Panayi, Life and Death in a German Town. Osnabrück from the Weimar Republic to World War II and Beyond, London 2007, Jill Stephenson’s Hitler’s Home Front. Württemberg under the Nazis, London 2006, and Stephenson, Generations, Emotion and Critical Enquiry. A British View of Changing Approaches to the Study of Nazi Germany, in: German History 26 (2008), pp. 272-283. 4 Unsere kleine Stadt, in: Spiegel, 28 November 1966, pp. 59-62. Andrew Stuart Bergerson, All Politics is Local. Revisiting William Sheridan Allen’s Northeim, in: Zeithistorische Forschungen/Studies in Contemporary History, Online-Ausgabe, 5 (2008), H. 3, URL: http://www.zeithistorische-forschungen.de/3-2008/id=4412, Druckausgabe: S. 469-474.